The photo below made on the 4th of October was supposed to accompany last week's apple shot, posted for the day of the storm that felled a big apple tree. Gives more gravitas to the Season "Fall", Mary. Mary MacADNski: I guess it does. Ce pommier donne beaucoup de pommes. Jolie présentation. Oh dear what a pity, are you going to plant another one? Mary MacADNski: I have a small leaf linden that I mistakenly planted too close to a black maple so I will move it there in the spring. The other half of the tree is still standing so I am not sure if it should be removed. I think it could fall easily if not removed. I wonder it will continue to grow? We've lost a lot of trees recently in some early gales; still having plenty of leaf, they can't take much of a battering at their age. Mary MacADNski: That part is being removed but I am wondering about the other half of the tree. It may fall easily so I think I will remove it too. 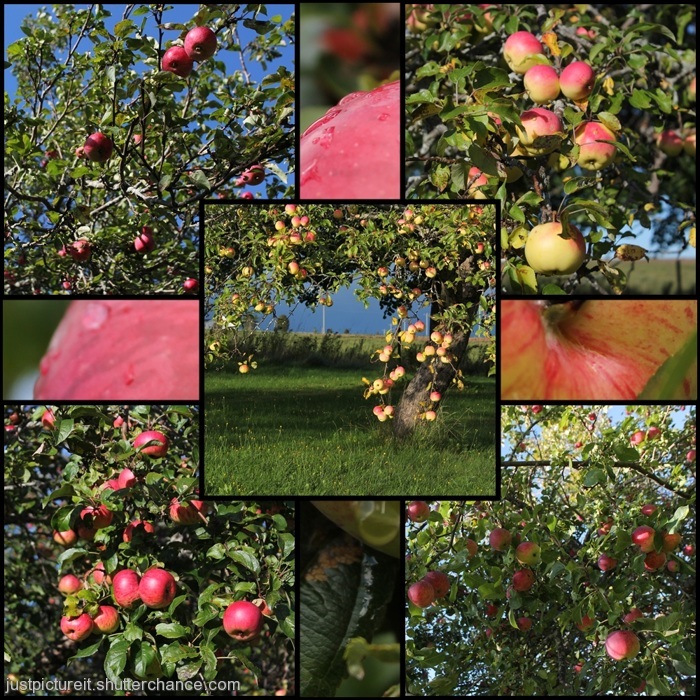 Shame about the Apple tree but not the collage, what a beautiful image. Mary MacADNski: Thanks, Brian. I have been working on apples and the tree all afternoon. Lovely looking apples Mary. what variety are they? Mary MacADNski: I am not up on my heritage apple types. An expert came here to look for extremely rare types but did not find any. Other than that, I know which ones work best for what. The fallen tree's apples are similar to a Macintosh but if is a grafted tree so has tow types. Mary MacADNski: I lose trees every couple of years but I keep planting new ones. Mary MacADNski: Lots of felled trees here too but our neighbours, Cape Breton got severe wind and flooding, a real disaster.